Nintendo Switch is a unique hybrid system that blurs the line between console gaming and mobile play. 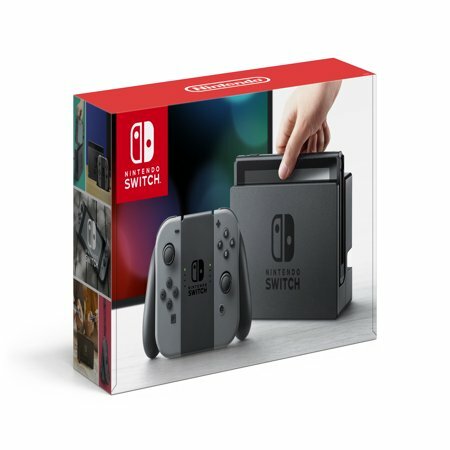 With its modular design and adaptable Joy-Con controllers, Nintendo Switch can be played with family and friends in the comfort of your living room, or lifted from the included dock for the same great gaming experience that now travels with you. In TV Mode, you can dock the console, attach the Joy-Con controllers to the included Joy-Con grip accessory and play on your TV for a traditional gaming experience. If you're gaming on the go, you can instantly transition to Handheld Mode by removing the console from the dock and attaching the Joy-Con controllers to the sides. With its bright, high-definition touchscreen display and robust battery offering hours of mobile play, Nintendo Switch offers the full gaming experience at home and beyond. I bought this for my son for his 5th birthday. He absolutely loves it. I like the fact that it takes cartridges instead of discs for games. The only thing I dislike is the tiny controllers. I know you can but attachments, but it'd be nice to be included. Best drunk purchase I've made online in a long time! Product arrived promptly in perfect condition. I was contacted one day after the purchase by phone to confirm my order. Looking forward to the future of the Switch. Early adopters have complained of hardware issues, but I have yet to experience any Joycon problems, etc. Buy a screen protector though, the dock is not well padded. Bought it for my son and he loves it ! Bundle is the best way to purchase! I bought this as a gift and what a surprise it was and still is! My kids got this for Christmas and can't put it down. The graphics are way better than the Wii U and the games are revamped and the kids are having a blast.